The Queen of Denmark went to the funeral? It states that Prince Henrik attend the funeral, but not Queen Margrethe. Considering the large numbers of ex prisoners of war still alive at that time within Britain I think Prince Philip's attendance along with Geoffrey Howe's was an acceptable solution. Britain could hardly ignore the Emperor's funeral but magnifying it would have been wrong too. Britain's always identified with the European war and the defeat of the Nazis but there were many British casualties in the Eastern sphere of operations as well. The Kingdom of the Netherlands suffered enormous casualties under the Japanese occupation of their East-Indies territories. No one from the Orange-Nassaus did attend the funeral of Emperor Hirohito. The Dutch representation was the then Minister of Foreign Affairs, Mr Henri ("Hans") van den Broek. He is the father of Princess Marilène (spouse of Prince Maurits van Oranje-Nassau, Van Vollenhoven), see picture. So, retro-actively, an in-law to a royal did attend. TOKYO — When Emperor Hirohito died Jan. 7, many average Japanese found themselves staring at a word in two-inch-high banner headlines that they had never seen or heard before. Older Japanese who remembered what they were taught in school before 1945 knew what it meant and that it could refer only to a Japanese emperor, or a Japanese emperor's wife, mother or grandmother. But younger Japanese had to rely on deduction. The size of the headline type and the knowledge that Hirohito, 87, who assumed the throne in 1926, had been gravely ill for nearly four months led most of them to guess correctly that the strange word, hogyo, meant "death." The Japanese language normally is structured into three distinct levels of politeness. One can talk down, or up, to a person, or speak on a level of equality. But when referring to the emperor or the Imperial Family, a fourth level of ultra-subservience emerges. Every noun and verb changes form. Honorifics and the passive voice--or sometimes both--are used, thwarting attempts to translate directly into English. No equivalent grammar exists. Such flowery language is used in formal situations to refer to eminent figures of a lesser standing than the Imperial Family. But newspapers and TV stations use it only for the Japanese royalty. According to the Japan Publishers Assn., only five of its 114 member newspapers failed to use hogyo for the emperor's death in their banner headlines. Two of them, both in Okinawa, and a non-member newspaper, Akahata (Red Flag), organ of the Communist Party, had their own political reasons for demurring. I don't understand what the Queen or my signature has to do with Emperor Hirohito being a war criminal or not. I am fully aware that the Queen, but also US presidents and other heads of state both received and visited him on state visits. 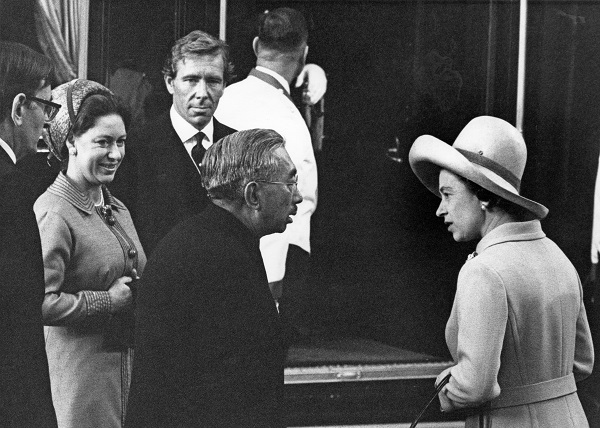 When the Queen received him on his state visit to the UK in 1971 and when she made a state visit to Japan in 1975 he was a constitutional monarch. If you don't believe that he's a war criminal, then you can just say so instead of coming with that kind of nasty comments/posts towards me. I do think that the Emperor Hirohito had a lot to answer for in regard to his decisions and the measures he took before and during World War 2, as well as the Japanese troops fighting in his name. He was certainly a very contentious figure. Of course he didn't stand trial because the administration of General McArthur and the US government judged it best that he not be and who knows, there may well have been a bloody uprising of the most terrible kind if they had done so. After all, Wilhelm II also got away with not going on trial after the First World War by slithering away to the neutral Netherlands which gave him sanctuary. The difference between the two was of course that one abdicated. I agree, but this isn't the thread to discuss that. I was just saying in my first post where I posted some videos of his death and funeral that I call/see him as a war criminal. If people disagree with me, they can just say so instead of coming with nasty comments as Duc et Pair did. It is not a nasty comment. You labelled someone as a "War Criminal" and ended with the usual closing line of "most wonderful, non-judgemental, forgiving, etc." and that was quite a clash with your qualification of the Emperor. That is all. You said "The Queen is the most wonderful, forgiving, non-judgemental person I know" (the phrase you close all your posts with) did receive this "war criminal" in her house anyway, as other royals did.'' I find that to be a nasty comment, and the Queen and my signature has nothing to do with Emperor Hirohito being a war criminal or not. Please, let us discuss the topic of Emperor Hirohito's funeral and stop bickering. If people wish to hold a private conversation, they should do so by PM and not within the thread. Nobuo Ishihara, 91, who was deputy chief Cabinet secretary at the time, wrote in his book that the government had decided to start the project after Emperor Hirohito’s health deteriorated. [...] 20 to 30 top-quality Japanese cypress logs needed to be procured to build the main facility for the Taiso no Rei (emperor’s national funeral ceremony). Deciding to use trees planted in Taiwan by the Meiji Era government that were about to be cut down, Ishihara proposed then-Prime Minister Noboru Takeshita that a major contractor temporarily shoulder the costs of bringing the logs to Japan to keep the secret project from leaking to the public via the government’s budget allocations for materials procurement. Emperor Hirohito died on Jan. 7, 1989, and the Taiso no Rei was held at Shinjuku Gyoen National Garden in central Tokyo.